There’s nothing better to cheer up a gloomy day like a good Android games sale. Its even better if it’s a Humble Bundle sale. 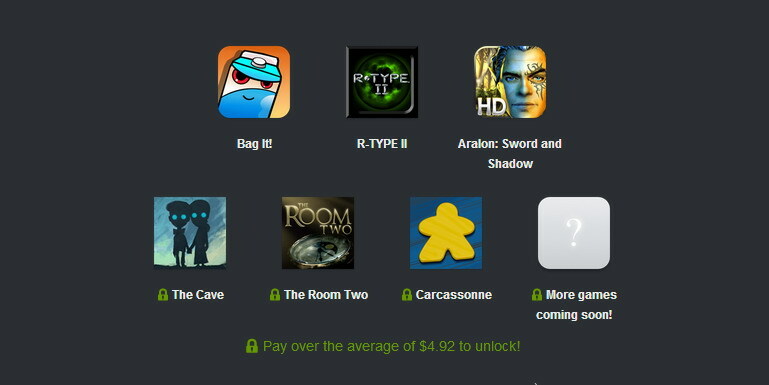 This time Humble Mobile Bundle 5 is packing six awesome Android games including Bag it!, R-Type II, Aralon: Sword and Shadow, The Cave, The Room 2, and Carcassonne. You can pay any price you like for the games, but if the total is below the average price of the games, you only get to pick up Bag it!, R-Type II, Aralon Sword and Shadow. Any donation more than $4.91 will unlock the additional three games. Plus, a surprise pack will be unveiled on Tuesday next allowing anyone who has donated above the average price of the games to pick up a few extra ones. If you’ve never bought this bundle before, remember you can choose to spread out your payment between the developers, a couple of charities, and the Humble Bundle team. Now lets take a quick look at some of the games in the pack. Bag it! is a fun puzzle game that has you trying to fit as many groceries as you can into a big bag. The game also comes with an awesome original soundtrack featuring 10 lighthearted tracks from Kole Audio Solutions. R-Type II is a side scrolling arcade game where you will be controlling a ship called R-9C and shooting your way to victory. Aralon: Sword and Shadow is an awesome 3D RPG where open world exploration and quests will provide you with many hours of enrapturing gameplay. The Cave from Double Fine Productions will set you off on an adventure into the cave where you will solve puzzles and discover the truth behind each of your adventurous team members. Cryptic letters and hidden clues inside boxes lie in a room waiting to be revealed in The Room 2, a puzzle game that is so intriguing and mesmerizing that you will find it impossibly hard to put down once you get started. Carcassonne is based on the popular board game that will have you placing tiles with roads, cities, fields, and such to create landscapes. If you buy these games individually, you’ll be paying up to $30, but with the Humble Bundle pack, you can pay as little as you want to. If you’re interested in the sale, be sure to check out the Humble Mobile Bundle 5 page.